Perfect for preparing delectable family feasts, the 3 Series Classic LS Plus D features strong and durable stainless steel burners for consistent performance every time you use it. 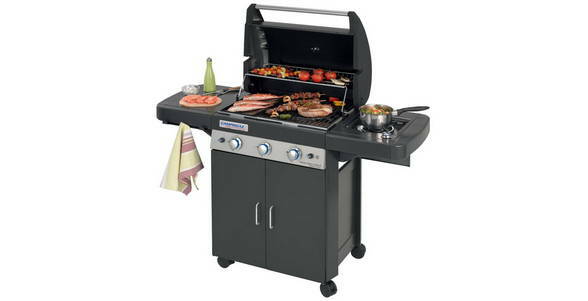 Making it easy to simultaneously cook a selection of meat, fish and vegetables, each of the barbecue’s three burners can be independently adjusted. An integrated rotisserie option is ideal for preparing roast chicken and for even more cooking versatility, the 3 Series Classic LS Plus D features our new Culinary Modular System. A folding side table and utensil hooks are ideal for condiments and accessories, while the extra side burner is perfect for preparing the tasty sauces or accompaniments that make it a meal to remember. Forget about whose turn it is to clean the barbecue, with our convenient Campingaz InstaClean™ System, keeping the barbecue sparkling is effortless!